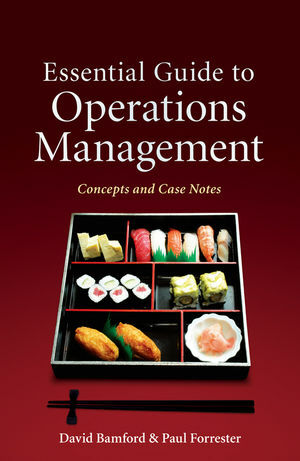 This book is a novel treatment of Operations Management. It takes a fresh insight to this increasingly important topic, exploring fundamental principles equally applicable to service and manufacturing situations. The book adapts a strategic stance by providing a framework for effective decision making and is aimed at practising managers who need to design working processes, manage change and make decisions within a strategic framework. The framework and supporting case vignettes allow the practitioner to grasp essential concepts quickly in a range of different operational contexts. "Bamford and Forrester have done an excellent job in creating a concise, salient, and appealing approach - they have captured the essential elements of designing processes, products and work organizations; exploring approaches to operations planning and control; managing change through effective project management and technology transfer; and then managing quality and improvement strategies". "This is an excellent concise text that introduces students to all of the key areas - it's an invaluable aid for students in understanding all of the major aspects of operations and their importance to the success of businesses". "For today's or tomorrow's business leaders this text has well structured invaluable content ready for immediate adoption. Follow the guide, put it into practice, and the rewards will follow". "This book combines technical theory 'book smarts' with real life experience 'street smarts' in a flowing read". Dr David Bamford joined Manchester Business School in 2000. He is an experienced industrialist/academic and a Senior Lecturer in Operations Management. In 2009 he was awarded the University of Manchester Distinguished Achievement Medal – Teacher of the Year 2009; in 2006 he won the University of Manchester Award for Teaching Excellence. His research interests include healthcare systems reform and review, strategic change management and organisational systems design. His many teaching/programme administrative activities have included: Director - NHS Leadership Programme, an MSc programme for senior NHS Directors in partnership with PriceWaterhouseCoopers; University lecture programmes in Operations Management (MBA and BSc); Quality Management: Concepts & Practice (BSc & MSc); Quality Management: Tools & Techniques (BSc); Business Improvement Tools & Techniques (MSc); Organisational Change (MSc). Dr Paul Forrester is a Senior Lecturer in Operations Management and Director of a Full-Time MBA. His research interests lie in the strategic, design and organizational issues of managing operations, the extension of operations management concepts to service organizations, and the management of technology transfer projects. Though his early work was predominantly UK-based, the research has become increasingly international in nature, the latter having included studies of the impact on companies of foreign direct investment and technology transfer, and comparative studies of operations management practices in the emerging economies of Pacific Asia and Central/Eastern Europe. Chapter 11 - Making It All Work!